The first from a series of beer I picked up from the local supermarket last week when they had a whole bunch of American craft beers in.... Not a brewery I've tried any from before so looking at their website I do like the fact they list what hops that are used in each beer, which is something I wish more breweries would do. Big aromas from the bottle and pour of grapefruit, pine and hops. Pick Axe pours cloudy amber with a creamy off-white head. Malt, citrus peel and floral on the sweetish intake while the long finish is bitter. Caramel and malt linger in quite a dark metallic hoppy aftertaste. It has a nice enough light mouthfeel without being watery. No alcohol shines through. Very malty for an IPA though not a huge distraction, it is more of a nice surprise. It is not an ale I would call refreshing despite being light, mainly due to all the maltiness it became more of a light sipping ale. I quite enjoyed this without being totally bowled over by it. Not one I will be running out to buy but I would have no problems drinking this again if the offer came up. 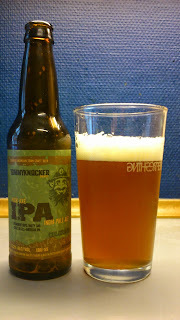 All in all, a decent IPA that is a good bit above average. This scored 7/10 on the ' I want to go out, don't know if I can, 'cause I'm so afraid of the Tommyknocker man'.. Beerometer. Where to buy CPH : Superbrugsen, though no doubt some bottle shops will carry it.